Maxibright Daylight 315W CDM kit with Philips Daylight Bulb/ Adapter + Reflector. This is the ULTIMATE 315W Daylight Lighting Kit. There are several cheap versions on the internet from the likes of Omega, which only give out a 50-60hz frequency, which will never unlock the bulbs true potential. The all new Ceramic Metal Halide lighting kits from Maxibright combine intensity with efficiency to create the most productive lighting kit available on the horticultural market. The precision design and build of the Maxibright 315w ballast brings out the best of Phillips unrivalled ceramic metal halide bulbs. These ceramic metal halide bulbs are available in two forms, the daylight bulb for the growing period and the agro bulb made specifically for the flowering stage of your favourite plants life cycle. The 315w ceramic metal halide lighting kits give out the highest ratio of usable light per watt of power consumed (1.9 UMOL per watt of electricity) making this lighting kit one of the most efficient combinations on the market. The spectrum of light that the 315w daylight bulb gives out is nearing the same wavelengths as the light emitted by our very own light in the sky, the sun. The most comparable light in terms of spectral output is a plasma light that also lies at at >90 on the colour rendering index (sunlight is 100) but the plasma light lacks the intensity that the CMH supplies. For this reason the CMH units have frequently been referred to as the plasma killers. This broad range of light supplies the plants in your grow room with every wavelength of light they could possibly want. This replicates the same conditions as they would be subjected to in their optimal outdoor conditions, without a cloud in sight. This broad range of light leads to more compact growth, more flowering sites and larger root systems delivering outstanding results at affordable prices. Tests have shown that the double bulb units are covering an equivalent area to 1000w hight pressure sodium fixtures, as well as giving much more vigorous and uniformed growth patterns. In terms of price, these units are much more competitively priced compared to the 1000w and other 315w units. There are two reflectors available specifically for the 315w CMH bulbs to be housed in. One reflector is designed to house a single 315w bulb whilst the other can house two. These reflectors are designed to give an even spread of light with the single bulb unit covering a meter square whist the twin bulb reflector is designed to cover a 1.5m square area. Both of these reflectors have 5m long leads to help you position the reflectors and ballasts how you choose without the use of extension cords. The fixtures that the 315w Philips bulbs come with is different to most common high pressure sodium and metal halide fittings (e40) but an adapter is available to convert all of your existing shades to accept these highly efficient bulbs, making it a simple task to install 315w ceramic metal halide lighting kits to your current set up. The Maxibright 315w ballasts themselves are lightweight, compact, cool and silent running as well as having all the great features of other quality Maxibright ballasts. This includes soft start technology, end of lamp life detection as well as thermal and short circuit protection, making them an ideal addition to any grow room whether it is a new build or an existing set up. We dispatch packages daily during the week, generally speaking if we receive an order by 11am it'll get dispatched that day. If your tracking reference is long and all numbers you can t.
If our courier cannot deliver your parcel after two attempts they return it to us. All our items are wrapped in black plastic pallet wrapping with no identifying product names or company info ensuring discretion. Please note: butane canisters and Isopropyl Alcohol cannot be delivered outside the UK due to it being a hazardous material. If you'd like to speak to one of our team please call either 01226 399837 or 0114 275 3353. This caveat is due to tents rarely going back into the box as they came out. Also that existing grow rooms may contain pathogens, if we accept the return it'd risk spreading the pathogen to the customer's grow room who buys the tent in future. 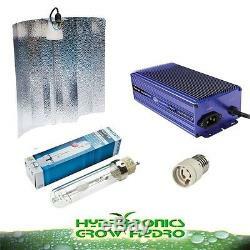 We Green Spirit Hydroponics Ltd. Are a supplier of Hydroponics and Horticultural Equipment. Our registered company number is 05661695, and we trade from Unit 6, Rockingham Business Park, Rockingham Row, Barnsley, S70 5TW. We also hold the right to refuse sale of products to anyone who we suspect is going to break United Kingdom laws by growing plants that are illegal within the UK. Image for illustrative purposes only, the general look of the product may be slightly different due to newer models coming out. Updated images are uploaded when and where possible. As an Internet retailer we adhere to all UK laws to which we are bound. Placing any order on this website or over the telephone with a representative of this company means you accept the above terms and conditions of ordering. We will always do our best to improve the situation for you. Listing and template services provided by inkFrog Open. The item "Maxibright Daylight 315W CDM kit with Philips Daylight Bulb/ Adapter + Reflector" is in sale since Monday, January 23, 2017. This item is in the category "Garden & Patio\Hydroponics & Seed Starting\Grow Light Kits". The seller is "hydroponicsgrowhydro" and is located in Barnsley, South Yorkshire. This item can be shipped to United Kingdom.